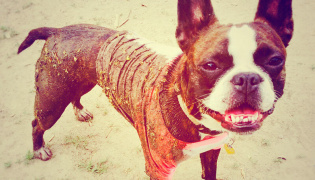 At some point or another most of us who own dogs will encounter a situation where our pet(s) have an upset stomach. This condition can be indicative of a serious health issue that requires veterinary attention, or it may just be a minor upset that can be effectively dealt with at home. Generally, if we know our dogs well we will have a pretty good idea as to whether an upset stomach can be successfully treated at home. 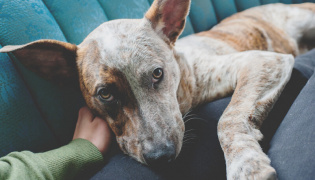 Here are some suggestions for treatment that may help your canine buddy recover if you feel safe in dealing with the issue on your own, without veterinary help. 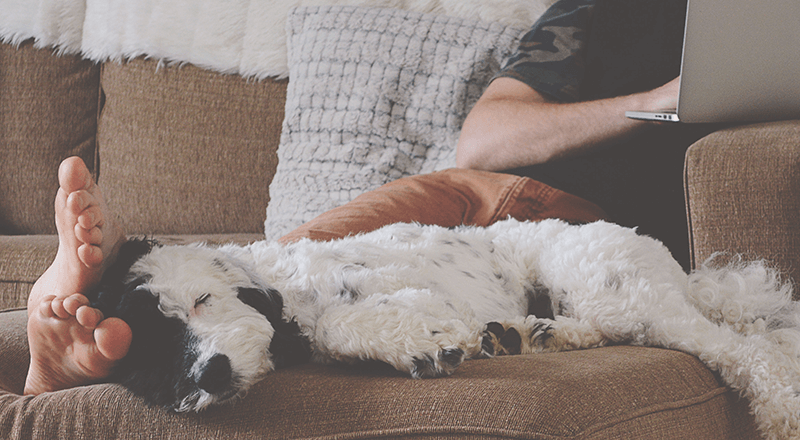 Causes of troubled tummies in dogs vary widely, from grave issues such as pancreatitis to ingestion of an item that your dog simply shouldn’t have eaten. Even something as simple as a new kind of treat can set things off. Gastrointestinal upset can also be caused by a sudden change in diet. Symptoms brought on by the latter two reasons can include general malaise and loss of appetite, intermittent vomiting, diarrhea, eating grass and a gurgly tummy. More acute problems have more severe indicators and need veterinary attention. It is generally recommended to withhold all food for 12-24 hours to give your pup’s stomach an opportunity to settle down. It is also advisable to monitor water intake, offering small amounts of water at frequent intervals, this should be sufficient enough to keep him hydrated. Free access to water could encourage your dog to drink too much, thus increasing the frequency of vomiting and ultimately leading to dehydration. 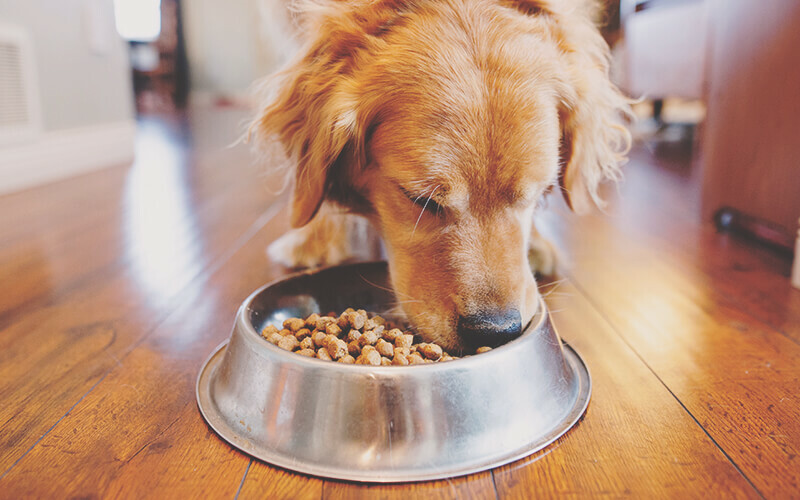 If you choose to do the 24-hour fast, plan to offer your dog very bland foods that will help his stomach re-adjust to having something in it. Recommendations include boiled white rice, cooked chicken with no skin, fat and bones removed and/or boiled ground beef. The combination of rice and meat should be at a 2-1 (two parts rice one-part meat) ratio, which allows the larger amount of rice to act as a binder and relieve diarrhea symptoms. It is important to cook the rice to a mushy consistency. You can also add a bit of canned pumpkin (not the pie mix, but straight pumpkin). Cooked whole eggs are also an excellent protein source and may help to pique your dog’s interest in his food. When re-introducing food be sure to offer several small meals rather than two or three larger ones. Try to think how your stomach feels when it is upset and apply that same thought process to feeding your dog when he is in a similar condition. 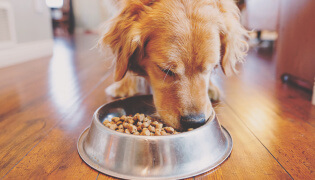 In addition to the bland diet, which should carry on for at least a couple of days, you may help the recuperation process by giving your dog a number of holistic options. A small amount of ginger may assist digestion in dogs, and slippery elm bark and prebiotics available in most natural health outlets may also help. Slippery elm bark comes highly recommended by many vets for many reasons. It is a natural prebiotic, which means it can help to re-establish the healthy flora in your dog’s intestinal tract. Mixed with cold water, slippery elm bark powder also has lubricating qualities that may help soothe the intestinal tract and relieve acute diarrhea. Additionally, its bland taste makes it easy to combine with tasty foods to ensure that your dog ingests the correct amount. Veterinary recommendations direct the administration of 1/2 teaspoon per 10 pounds (4.5 kilograms) of body weight, mixed in cold water and added to the bland diet twice daily. Although slippery elm is considered safe for dogs of all ages and can be used in combination with other medications, it is a good idea to consult with your vet regarding usage. In the end, if you know or suspect that your dog has ingested something he shouldn’t have (providing it isn’t poisonous or likely to cause a blockage) or if he has undergone a sudden change in diet, you should be able to treat his tummy troubles at home with the aforementioned special diet and lots of tender loving care. If, however, symptoms worsen rather than improve and if your pet clearly isn’t feeling better within a couple of days you should contact your veterinarian. 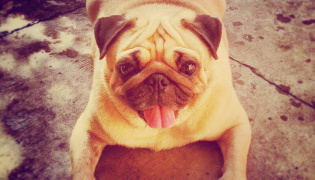 Shirley has been involved with the purebred dog world for 45 years. 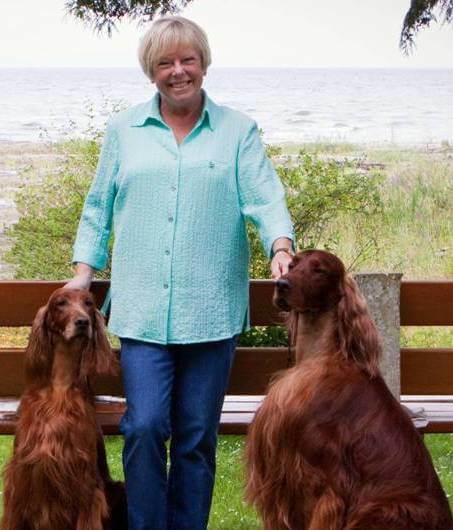 Her Irish Setters have won many Best in Show awards, top obedience accolades, field titles and advanced agility titles. She remains active in dog volunteer work and through her ‘Home Away from Home’ dog sitting service.